Choose what do you want to be in Maple World? Each has its roles, skills and responsibility in safeguarding Maple World. With 5 main classes and more than a dozen ultimate jobs to choose from, your character's paths are endless. Adventurers, the original five classes with the potential to change into various different jobs and possibilities. 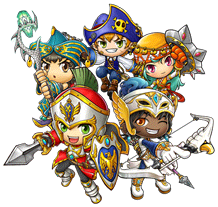 Knights of Cygnus, the five dutiful classes with unwavering loyalty to their Queen, set on protecting the Maple World from the Black Wizard. Aran, the legendary spear-wielding hero who was frozen in ice by the Black Wizard's curse and had just awakened from a centuries long sleep. 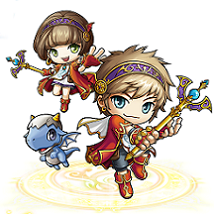 Evan, from a normal farm boy turned into the legendary Dragon Master controlling the ever powerful Onyx Dragon! 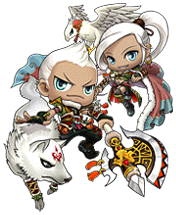 Dual Blade, join the secret army of elites lead by Lady Syl to confront against her former love, Dark Lord! 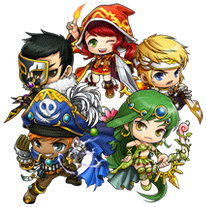 Become a part of MapleStory with the character of your choice!